Finding the perfect bicycle at the right budget can sometimes be harder than finding the perfect pair of jeans. When you're under 5"3' or over 6", it may seem downright impossible. Many bikes on the market nowadays come in a few generic sizes: L, M, S and maybe an XS - and even that may be too large for some of us. When sorting through Craigslist for affordable, used options, it can be even harder to figure out what will fit. On fit: When you're standing over your top-tube, can you lift the bike up? Can you stay seated on your saddle and still reach the ground with your feet? An issue tackled by the Lovely Bicycle here: http://lovelybike.blogspot.com/2011/06/putting-your-foot-down.html. On comfort: Do you feel like you're reaching too much to get to your handlebars? Especially to beginners, this kind of discomfort may seem like something one can "get over" after they've put more miles in on the saddle. Being able to come to a comfortable stop and stand over your frame, however, is an important skill that comes with being well-fitted on your bike. Two years ago I started reading books, blog posts and talking to bike mechanics and designers about frame geometries for shorter riders like me. Here are some tips I've learned for those looking for a bike for your size and budget. Look beyond 700C wheels — Consider frames that are designed for smaller-sized wheels. Mountain bikes or vintage bikes in smaller sizes often come with 26-inch wheels. Read the label on the rim or tire to figure out what size it is. Here's Sheldon Brown's handy bike tire size chart. Foldable bikes, like Brompton's or Dahon's, mini-velos like Soma's, are all non-700C options that may fit your needs and budget as well. Shoes make a difference — Before going out and test riding bicycles, remember to wear the shoes and clothes you'll most likely be wearing when you typically ride. Whether you ride in loafers, boots, or clipless pedal bike shoes, the thickness of your soles and size of the shoe make a difference in how you stand over the bike and whether your toe clip could strike your front wheel. Check for toe-clip overlap — What is toe-clip overlap? Veloria from The Lovely Bicycle has a great post about it. Sometimes on smaller frames, the bicyclist's toes can strike the front wheel when making a slow turn. Bike enthusiasts debate whether toe overlap is an issue - but it's one way to compare how various different bikes ride (see link below). Note the position of your foot on the pedal and the angle at which the front wheel and pedal will strike. Is it an extreme angle? Or not so much? You can decide whether it's a dealbreaker or not. Any accessories on the front wheel, like fenders or panniers, may exacerbate the problem as well: http://lovelybike.blogspot.com/2011/01/whos-afraid-of-toe-overlap.html. You can change more than just the saddle height - Bike seems to fit, but doesn't feel quite right? You can tweak your bike fit. If you're buying a bike at a shop, don't be afraid to ask to swap parts. 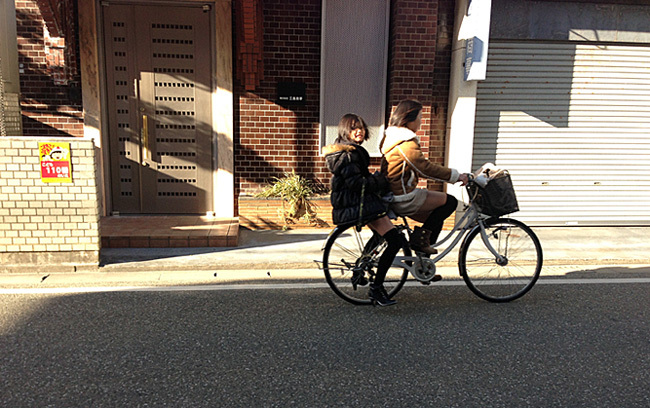 On most bicycles, handlebars - everything from the type of bars, the reach and height of the bars - can be changed. Handlebar stems, the part that connects the handlebars to the frame, come in many heights and lengths. You probably know that the saddle height can easily be adjusted, but the saddle can be adjusted horizontally to sit closer or farther from the handlebars as well.